Christmas Time- What Doctor Who stories can be used? In only 19 days it’s Christmas (!!!!!!!!!!!). One of many things to look forward to is the Doctor Who Christmas special. I almost always love them (mostly. It took me a long time to appreciate A Christmas Carol and I found the one afterwards incredibly dull). I have a soft spot for them because despite my memories of the David Tennant era being patchy, I vividly remember sitting down watching the Christmas specials. So, with this year’s story having Santa, dreams (Mara return? ), Arctic bases and the Doctor in a hoodie, I’ve decided to take a look at some other ideas that could be used in future specials. So far we’ve had Sycorax, Racnoss, Hosts, Cybermen, the Master, flying sharks, tree things, snowmen and last year we had everything. What can join the brigade? One Christmas related myth I’ve been fascinated with is the Krampus. 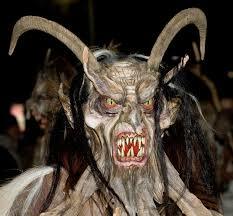 In German, Austrian and Romanian folklore, the Krampus is a demon who is basically the anti-Santa. He follows Santa around and punishes naughty children by trapping them in his sack and banishing to their lair. Seeing how Santa is in this year’s story, it’s not impossible for Krampus to appear this year, but if he isn’t, then next year would be a perfect time. Maybe the Doctor arrives at a town where children are being kidnapped and he goes off to fight Krampus. I think given time that Krampus will appear, but I’d rather it be sooner rather than later. This may have been already dealt with in The Snowmen, but that was just snowmen and an ice person. 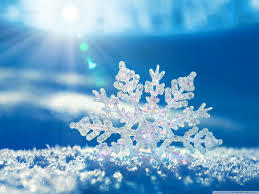 What I want is a special where the snow is a living, breathing monster, with each snowflake being a micro-organism which can kill people in a touch. It’s sort of like the Flood, except this time it is snow and can posses dead corpses and skeletons. This not only will be awesome but it could create a monster that will make people wish it doesn’t snow! The story could be that London is caught in a new Ice Age, but the snow entity is actually absorbing the human race for its own schemes. Now this one is silly, completely personal and will probably never happen. But how cool would it be? Not only would it be a great title, but the Silence can get a stand-alone story without the Series 6 arc dominating over them. They are a brilliant monster which should return, and what better time than Christmas? The Doctor arrives in a town or a planet where everyone has forgotten Christmas. Why? Because the Church of the Silence has taken over the place. Remember (or not), the Silence are not just after the Doctor’s life, in fact they helped the Doctor in the Time of the Doctor. There are many rogue branches out there, and I would love them to come back. Again, completely silly, but one of my favourite movies combined with my favourite TV show would be amazing. 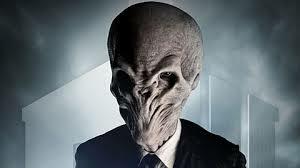 The Doctor arrives in a world where nightmares are real, and they are trying to break through to the real world. Their leader (Jack Skelligton!) jumps through a time loop and arrives on Earth at the dawn of humanity, becoming an anti-Santa and making everyone hate Christmas. The Doctor needs to stop this and avert the timeline back to normal. Not only would a skeleton Santa be cool, but this year’s Santa could then re-encounter the Doctor and fight Anti-Santa. Ok, ok, this is getting really cheesy, but it’s Christmas so I forgive myself. So those are four random ideas for next year’s Christmas special. Out of all of them, Krampus is probably the most likely one, with the Nightmare Before Christmas being the least. How excited am I for this year? Very! The Doctor and Santa versus Dream Crabs… 19 days to go! Next Why do people love Christmas? Very imaginative and well written post. I had never heard of the Krampus before. I really like the idea of a skeleton Santa. 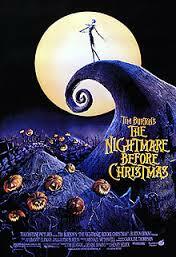 Maybe you should pitch this to Tim Burton.